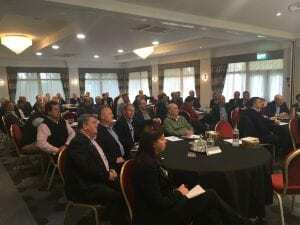 The annual ceda Regional Meetings took place earlier this month (Southern Meeting on 14th November, Northern Meeting on 21st November), with 37 Member organisations attending overall, and record attendance at the Southern meeting! It was pleasing to see, not only established Members amongst the delegates, but many of our newer Members too. Berkeley Projects, KCCJ, Scobie McIntosh and Sprint all sent representatives and threw themselves into the discussions and networking opportunities the meetings provided. Both meetings began with an Open Forum for Members to discuss issues with their peers. This was an opportunity for Members to share best practice with one another and offer help and advice where possible, as well as a chance to raise concerns with us, that we can investigate on behalf of our Members. It gives us insight into what issues are affecting our Members and how they do business, and how we can support them going forward. Industry and supplier issues were brought to our attention which we will now look into further and provide feedback on when we have it. Adam Mason gave a short presentation proving updates on Being ceda & Sustainability Pledge, the ceda Academy, Marketing and Social, ceda videos, BIM Training, ceda Safe (safety schemes in procurement for the catering equipment industry), the 2019 ceda Conference and Grand Prix Awards. Three short supplier presentations followed. At the Southern Meeting we heard from Welbilt UK, Hoshizaki UK and First Choice Catering Spares Ltd. In the North, Hobart UK, Mechline Developments Ltd and Electrolux Professional presented. Information which covered the Technical Conference 2018, key priorities including recruitment from the military, and the development of a new apprenticeship standard for a Catering Equipment Technician. 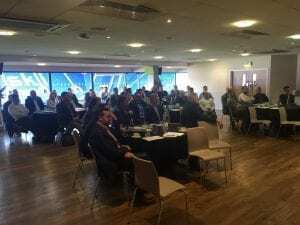 After a networking lunch, the afternoon sessions were made up of presentations from Caterquotes, Tim Knowles and RAMCO. Paul Shaw from Caterquotes spoke of Technology Solutions for the Catering Industry and new initiatives currently in development. Tim Knowles talked about safety provisions including asbestos, fire consideration in construction, and creating and maintaining safety cultures. RAMCO gave an insightful presentation on solutions to dispose of surplus catering equipment. The meetings closed with some final words from Adam Mason on the ceda Membership – recruitment, rentention and size, ceda Conference 2019 – venue, dates and business day programme, and an e-learning update. If any Members would like to see any of the presentations made at the Regional Meetings, please email Fiona Mason, fiona@ceda.co.uk, at the ceda office who will forward them on to you.